So, there’s been a little ongoing conversation on Flickr the last few days talking about how long it takes you to precrease a sheet of paper with a triangular grid. Taking off from that point, it branched out a little bit into how we go about the actual folding process. Ryan (the one who started this conversation!) just posted his folding process, here. I’ve just changed my normal folding process to utilize a method that I saw in one of Fujimoto’s books; I had to make some guesses, but I think I figured it out so it’s roughly the same. I posted a series of photos detailing the folding process which works pretty well; however, I also recorded a quick video and uploaded it to Youtube.com. You can click on the embedded video below and view the 4:30 movie, if you want more details. A few days ago, I folded this 7-pointed star. I put together a quick CP of the design, which is roughly accurate- you’ll get some fudging of a few lines, though. The main reference creases are accurate, however. 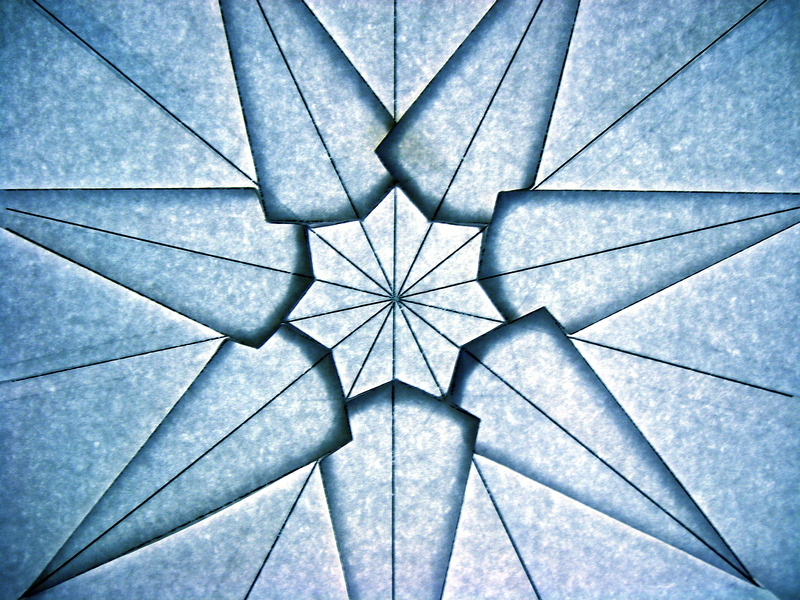 Download the Negative Space Heptagonal Star crease pattern here.